Alcohol distribution has not changed since the inception of the three-tier system at the repeal of Prohibition in 1933. 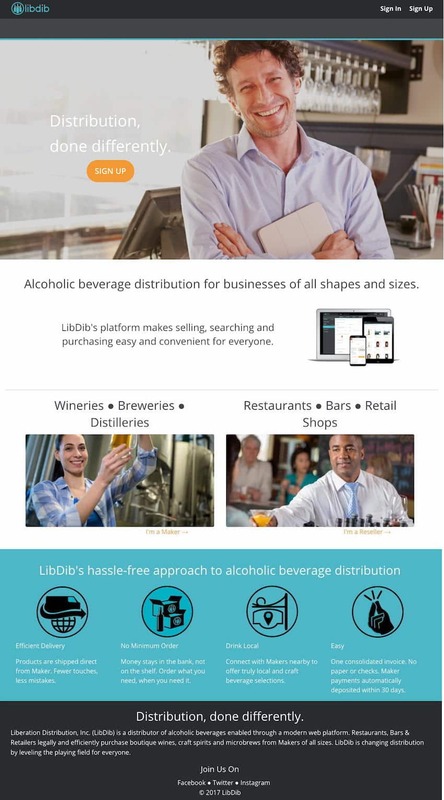 Today, a new path to distribution is available to beverage alcohol suppliers with the unveiling of Liberation Distribution TM (LibDibTM), the ﬁrst alcohol distributor and technology company to offer a three-tier compliant web-based platform. With LibDib, any maker of specialty wine, craft spirits and micro brews can easily set up distribution. state to order from makers of any size and from any location, whether down the street or from across the globe. Anyone interested in the LibDib platform can create an account and sign up starting today. Due to price posting in New York, transactions will go live in the coming months. The LibDib welrbased platform automatically handles the invoicing, payment processing, collections and taxes, allowing both makers and retailers to do business in a more open, efﬁcient and cost effective way. The company has been beta testing with a select group of makers and on and off premise accounts overthe past few months. Charging a lower margin for makers with most transactions at 15%. Processing payments in 30 days or less and providing on-demand sales reports. Giving makers as much freedom from Franchise Laws as legally allowable, enabling them to leave at—will and at no cost. Giving restaurants, bars and retailers a large and varied selection of boutique products from which to choose. Enabling direct communication within the platform between makers and accounts. Creating a level playing field for everyone with no unfair incentives or price breaks. No aging inventory sitting at the wholesaler warehouses. Eliminating the middle man and any potential for a sales representative to strong-arm the sales process. Allowing RB&Rs to buy only what they want, when they want it. No minimums. Giving access to unique, local and limited availability wines, craft spirits and beers. Sales materials and POS are always up to date and accessible online. Makers and importers from everywhere are invited to visit hitp:ﬂwww.libdib.com and onboard their products today. The company plans to expand to other states in the coming months.